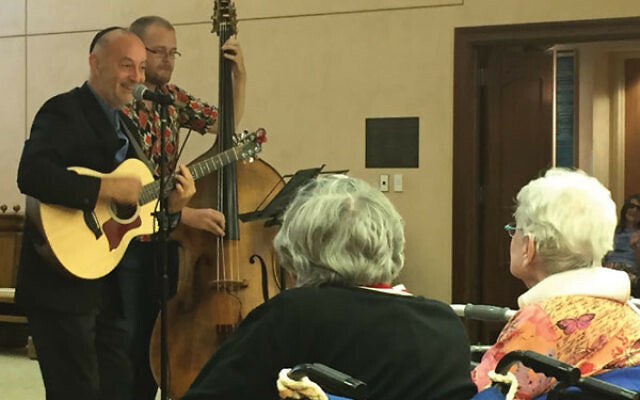 Rabbi Steven Blane and bassist Kevin Hailey mix secular Jewish and mainstream American music as they entertain residents of the Jewish Home at Rockleigh in Bergen County. 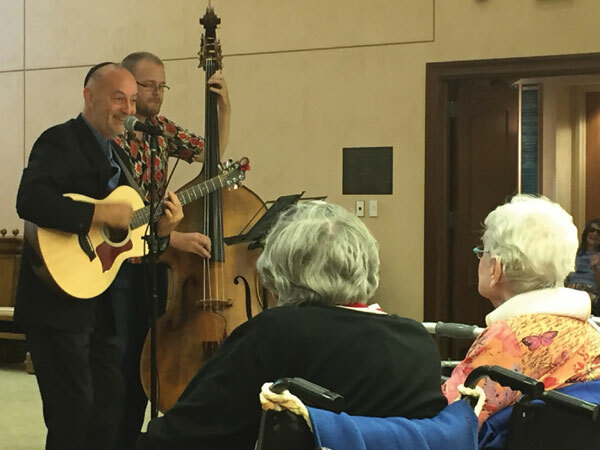 Ask Steven Blane whether he considers himself a rabbi who happens to be a musician, or a musician who happens to be a rabbi, and he’ll tell you, “I am a rabbi who is called to be a singer-songwriter. I don’t think one calling is higher than the other. I have a passion to write songs, and I have a passion to lead my services and to help whomever I can. Blane’s musical choices are part of the journey that took this 59-year-old composer, guitarist, and piano player from an Orthodox yeshiva in Jersey City to performing jazz-oriented High Holy Day services at the Bitter End, a popular folk club in Greenwich Village. At 15, Blane picked up a guitar for the first time and, he said he noticed, “the girls kinda liked it.” Not only did he dig back into the 1950s to learn doo-wop hits such as “In the Still of the Night” and “Teenager in Love,” he began writing his own compositions. “Back then I never even thought of jazz,” he said. “Then I met my wife, Carole. I told her I wanted to be a songwriter.” But after he and Carole had three daughters and moved to Bergen County, Blane said, he realized the responsibilities of parenthood. “I had three kids. What did I want to do? I had left Judaism. I was eating shrimp and doing all kinds of stuff,” he said. So at age 30, he began studying to become a cantor with his mentor, Hazzan Noah Schall. In 1992 he served at Conservative synagogues in Biloxi, Miss., and in Buffalo and Peekskill, NY, then at the Reform Beth Haverim Shir Shalom in Mahwah. Gelberman ordained Blane in 2001. He became the rabbi at two Conservative synagogues in New Jersey, the Bergenfield-Dumont Jewish Community Center and the New Milford Jewish Center. “But Conservative Judaism wasn’t for me,” he said. “It was too traditional. I felt like I was dying. I couldn’t do what I wanted to do because the dogma was very restrictive. “So what am I going to do?” he asked himself. “I said, ‘You know what? I’m going to build an on-line synagogue.’” He started by creating an Internet-based rabbinical school called the Jewish Spiritual Leaders Institute, which operates from an office in a building on Manhattan’s Upper West Side, where he also lives. His students are an eclectic group that includes cantors, scholars, gays and lesbians, and people of color. “You just have to be Jewish,” he said. Blane also uses the Internet to stream a Shabbat service every Friday night. He calls his congregation Sim Shalom (simshalom.com).